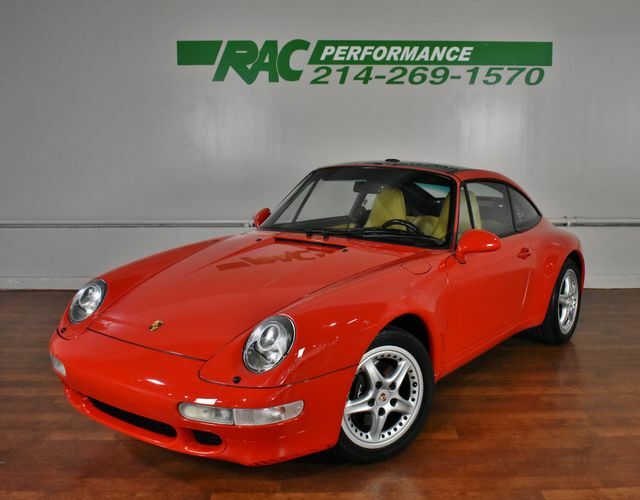 CLEAN CARFAX, 6-SPEED MANUAL TRANSMISSION, ZERO PAINTWORK, ORIGINAL MONRONEY STICKER, FULL SERVICE RECORDS DATING BACK TO 2001, BOOKS + 3 REMOTES/KEYS, ORIGINAL TOOLKIT AND AIR COMPRESSOR, GUARDS RED OVER CASHMERE/BLACK INTERIOR, TARGA ROOF, POWER SEAT PACKAGE!! This car has been inspected by our certified technicians and is ready to drive home. Upgrades are available at RAC Performance. TUNES, EXHAUST, WHEELS, TIRES and MORE! Contact our professional sales staff at 214-269-1570 for any questions or additional information. We also offer competitive finance rates as low as 2.9%. We hand pick only the finest automobiles to sell and every vehicle gets a rigorous internal inspection by our certified technicians. At our 9000 square foot state of the art facility, RAC Performance offers service on Porsche, RUF, Ferrari, Maserati and Lamborghini models. We offer dealership quality service and repairs at competitive prices and only sell the finest vehicles! We facilitate door-to-door shipping to anywhere in the world at an affordable price. If you prefer to visit our showroom, we offer free airport pick-up from either Dallas Love Field or DFW International Airport.